Unfortunately, "The Cabin in the Woods" had been stuck sitting on a proverbial shelf for a couple years while Metro-Goldwyn-Mayer was dealing with bankruptcy issues and other financial woes. The film eventually ended up in the good hands of Lionsgate Studios which allowed co-creators Drew Goddard and Joss Whedon to finally release their love letter to the horror movie genre and wow, was it worth the wait! This is a tough review for me to write as there are so many things about the movie that should not be spoiled, I am hesitant to put anything in my review. Just know that I enjoyed this movie thoroughly and everyone in the packed house that I saw it with felt the same way. This is definitely a movie to see in a full theater as there will be a ton of screaming, cheering, laughing, oohing, and aahing going on throughout. What I will say about the story is that it is a new twist on the classic horror movie set-up. Five teens set out for a fun weekend at a remote cabin on a lake up in the mountains. Of course, something will severely change their plans although, this time around, it is in ways you would never expect. Believe me...this will surprise you. And you will love it. The five teens are played by Chris Hemsworth, Kristen Connolly, Anna Hutchison, Fran Kranz, and Jesse Williams. 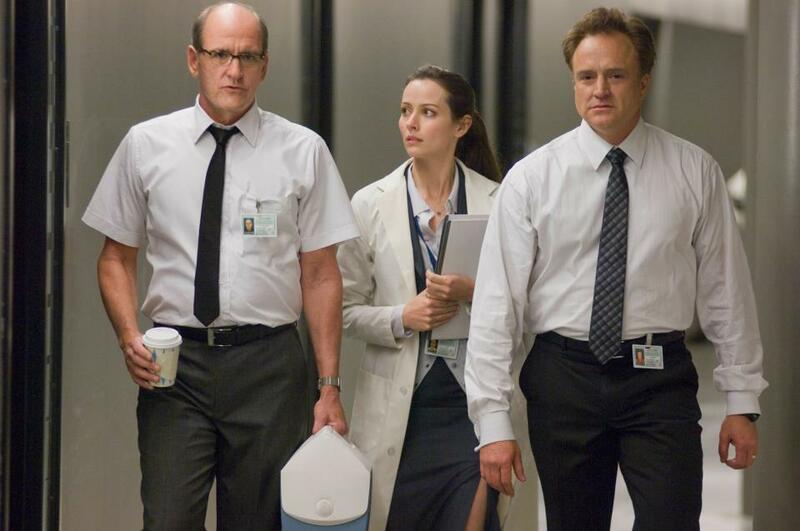 Richard Jenkins, Bradley Whitford, and Amy Acker also have roles in the movie. Acker is best known for her roles in Angel, Alias, and Dollhouse along with Goddard, who was a contributing writer and producer on all of those shows. Chris Hemsworth has gained recent fame for playing the title role in Thor and the upcoming Avengers movie which was directed by Joss Whedon who, of course co-wrote and co-directed this movie. Yes, this is a very tight knit group of creative talent. Normally, I include a trailer at the end of my reviews, but the one that is available for this movie has several spoilers and I am not down with that. Drew Goddard himself is very upset about the studio-produced trailer and has tried to get the issue fixed with no success. Fortunately Lionsgate, which is the studio responsible, has taken other measures to keep a lot of the movie under wraps. If you can avoid seeing the trailer before you go see the movie, please do so. 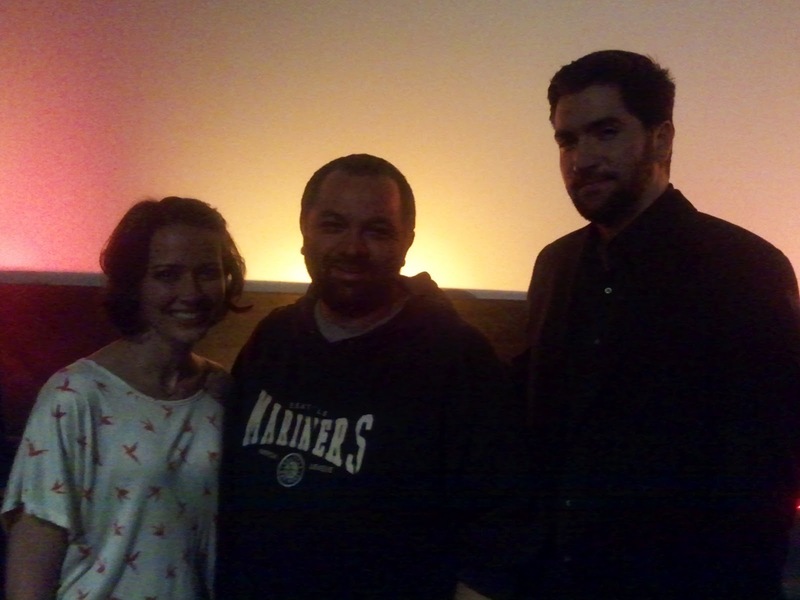 Here is a picture of me with actress Amy Acker and director Drew Goddard after a post screening Q&A they participated in. Drew Goddard was really cool and you can tell he is just as much a fan of movies as anyone. He talked about how making "The Cabin in the Woods" is his homage to the horror genre and especially to directors Sam Raimi and John Carpenter who are huge influences on his work. When I asked Goddard if there are any other genres he would like to give this type of treatment to, he replied, "Other genres would be much more difficult to do as they aren't as perfectly suited for it like the horror genre is." Other than that, he didn't have a real solid answer to give, but you could see the wheels turning in his mind and he jokingly suggested he might do a romantic comedy. Joss Whedon and Drew Goddard brought us Cloverfield and I really dug that so I will definitely give this a chance. I've heard nothing but praise so far from those that have seen it. Mark, thanks for the comment and I totally agree. Cloverfield is a great movie! 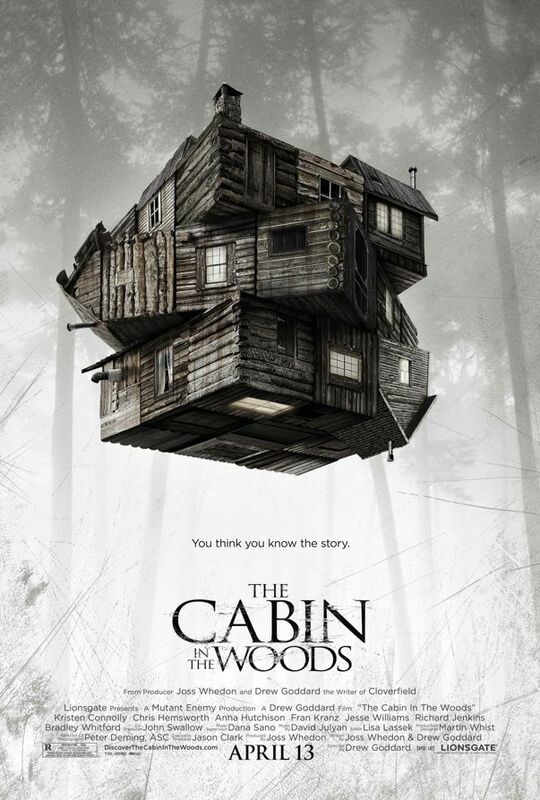 Have fun watching Cabin in the Woods! From scene to scene, moment to moment, you’re absolutely invested in seeing what happens next, if only to see what kind of tricks these film-makers have up their sleeves. It's also a film that’s as bloody as it is funny, but also scary at the same time. Nice review right here Marc. Definitely one of the funnest horror movies I've seen in quite some time. Yeah, its a great movie. I'm telling everyone to go see it. Thanks for the comment Dan! The Avengers: IMAX or Cinerama? 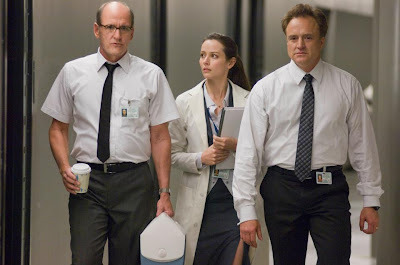 A Dark Knight Rises with the Avengers!